Students with disabilities who demonstrate appropriate social behavior are likely to experience positive peer and teacher relationships, increased participation and achievement in inclusive educational settings, and success in post-school work, educational, and social environments (McIntyre, 2003; Miller, Fenty, Scott, Park, 2010). In order for students to learn, practice, and maintain expected social behavior, educators must teach social skills within the context of the various school settings that students encounter each day. For example, when teachers explicitly teach, model, and reinforce the expectations and rules for appropriate classroom, cafeteria, playground, and bus behavior, students are prepared to interact effectively with others in each environment. Students have the opportunity to learn and practice skills in the environments in which they are taught, making it more likely that skills generalize to other school settings (Vincent, Horner, Sugai, 2002). Whether a student is having difficulty mastering an academic or social task, the teacher should respond by reviewing data to design targeted instruction that addresses the skill deficit. Since most academic environments have expectations for both academic and social behaviors, effective social skills instruction should be infused into the general education curriculum (Miller, et al. 2010). Ms. Sanchez was prepared for her third-grade students to arrive in her classroom on the first day of school. Three of her students had learning disabilities in reading and behavioral challenges. She had designed a classroom management plan that included teaching classroom procedures and routines around the school-wide expectations: Be Respectful, Be Responsible, and Be Safe. She had carefully considered the social skills, such as listening to others, raising one's hand to signal for help and staying seated during independent seat work, that were important for her students to successfully access the curriculum and to create a positive classroom culture. 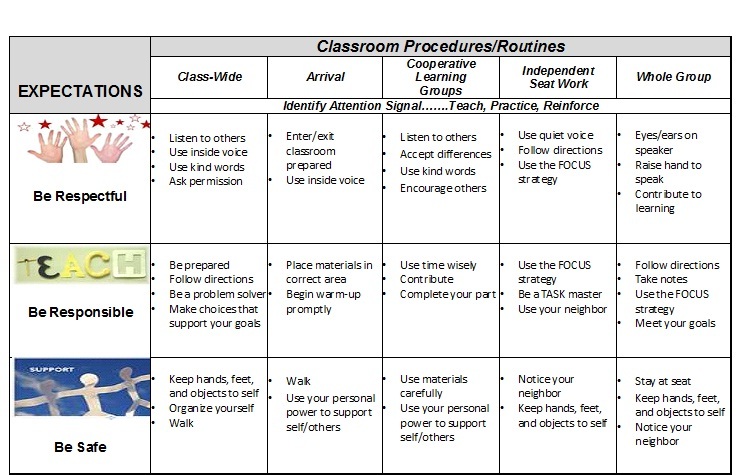 She embedded the skills into the following classroom matrix (Figure 1) which she posted as a reminder to the students. In addition to the matrix, she explicitly taught each skill within the context of the each classroom learning environment (e.g. 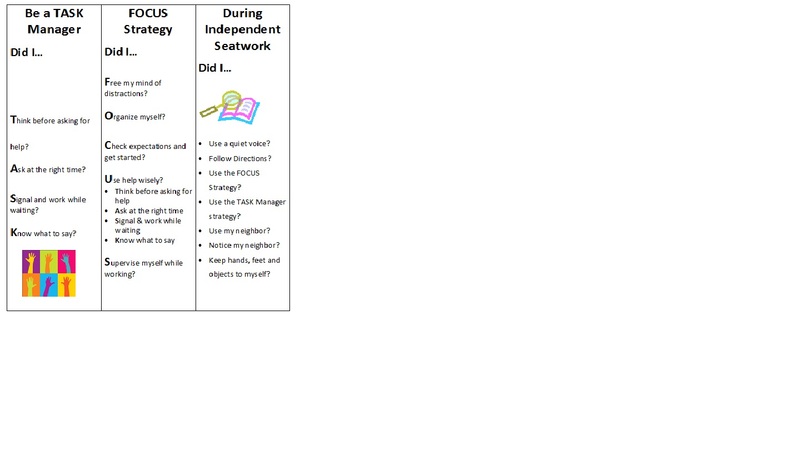 cooperative learning groups, independent seat work, arrival at school). 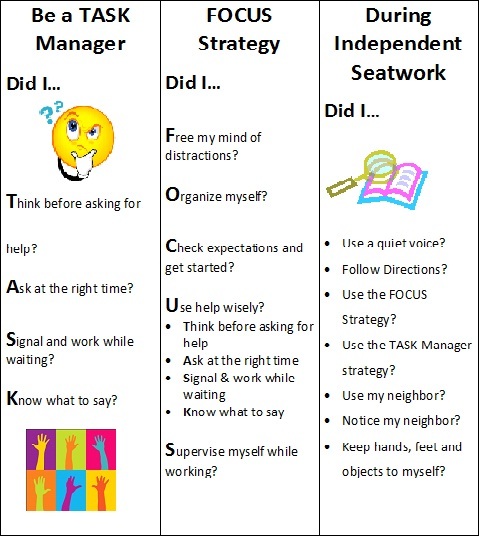 Additionally, she taught her students the Focusing Together Strategy (Rademacher, Pemberton & Cheever, 2006) an evidence-based, self-management strategy, to support the development of conscientious work habits, respect for the classroom community, and emotional and physical safety. 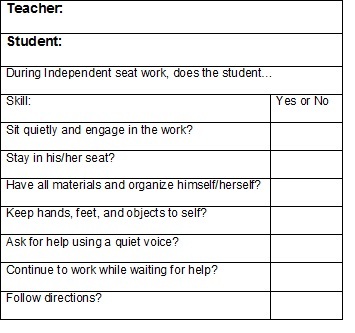 Lastly, she developed a data collection tool (Figure 2) to assist her with tracking progress on individual students who may not be responsive to the initial whole class instruction. Samantha, a student in Ms. Sanchez’s class, has a reading disability and behavioral difficulties. Ms. Sanchez’s data indicated that Samantha was having difficulty following the expectations for independent seatwork that required her to read independently. During assignments, Samantha talked to other students and was frequently out of her seat. If Ms. Sanchez did not immediately come to Samantha’s desk when she raised her hand for help, Samantha called out to the teacher, pushed her reading materials away from her, put her head on her desk, and sighed loudly. After reviewing the data and talking with Samantha, Ms. Sanchez and Samantha decided to focus their attention on the behaviors that were most distracting to her and the other students. These behaviors included asking and waiting for help appropriately and remaining in her seat during independent seat work. Ms. Sanchez reviewed the strategies and expectations with Samantha, and provided her with three bookmarks (Figure 3) so she could monitor her own behavior when she needed help from the teacher during independent seatwork. Samantha’s reading difficulties were contributing to her behavior, so Ms. Sanchez and Samantha’s special education teacher also provided additional academic support. With practice and reminders from Ms. Sanchez, Samantha was able to use the visual cues to stay on task and ask for help in a way that was not disruptive to her or her classmates. Her classmates also began to help Samantha when the teacher was not immediately available. Samantha liked using the bookmarks and enjoyed the positive attention that she received from Ms. Sanchez and her classmates. Her grades improved, and she started using the strategies in other classes and non-academic environments as well. Continue to monitor student progress (Miller, et al., 2010). Positive social behavior is a win-win situation for teachers and students. Students experience better peer and teacher relationships and teachers spend less time addressing negative behavior (Vincent, et al., 2003). There are several ways to approach the instruction of social skills within the general education curriculum. The Book in a Bag strategy (Marchant & Womack, 2010) is one example (see Figure 4). Check out the resources below for additional information about teaching social skills in the school environment. Check out these resources to find additional information about strategies for teaching social skills to students. Marchant, M. & Womack, S. (2010). 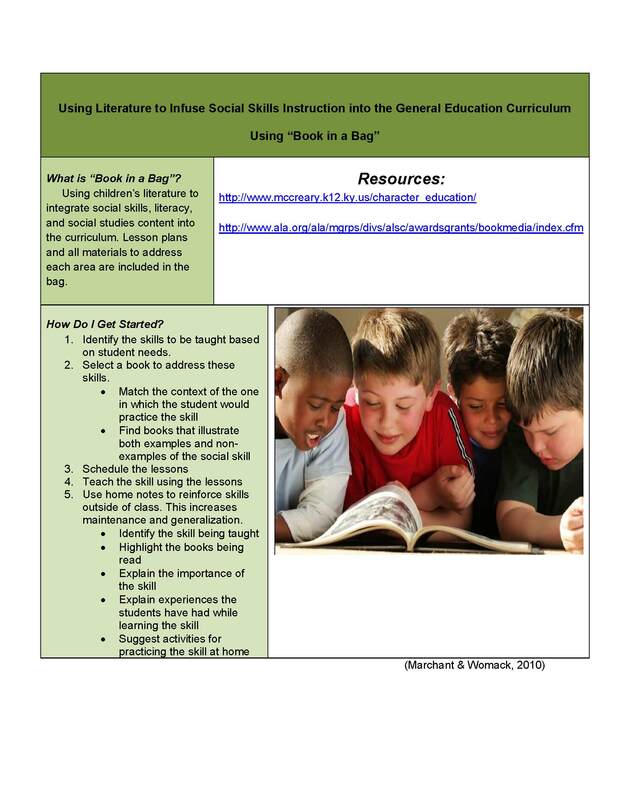 Book in a bag: Blending social skills and academics. Council for Exceptional Children, 42, 6-12. Miller, M., Fenty, N. Scott, T. & Park, K. (2010). An examination of social skills instruction in the context of small-group reading. Remedial and Special Education,1-11. Rademacher, J., Pemberton, J. & Cheever, G. (2006). Focusing Together. Lawrence, Kansas: Edge Enterprises.